Photo courtesy of Dynamo Pro Wrestling. Dynamo Pro Wrestling is proud to announce an all-ages professional wrestling event on Saturday, April 20th, 2019. 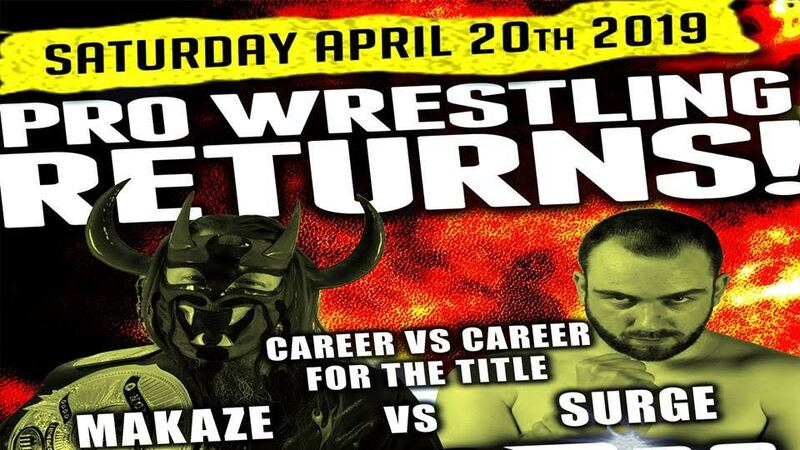 This professional wrestling event, sponsored by Slackers and Aries Screen Printing, will be held at the Concordia Turners Gymnasium, located at 6432 Gravois Avenue in St. Louis, Missouri. 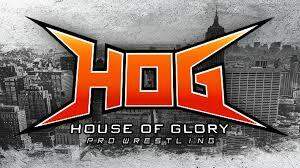 Doors open at 7:00 P.M. with a bell time of 8:00 P.M. Adult tickets are $10 in advance and $15 the day of the event. Tickets for children from five to twelve years old are $5. Tickets for children under five years old are free. 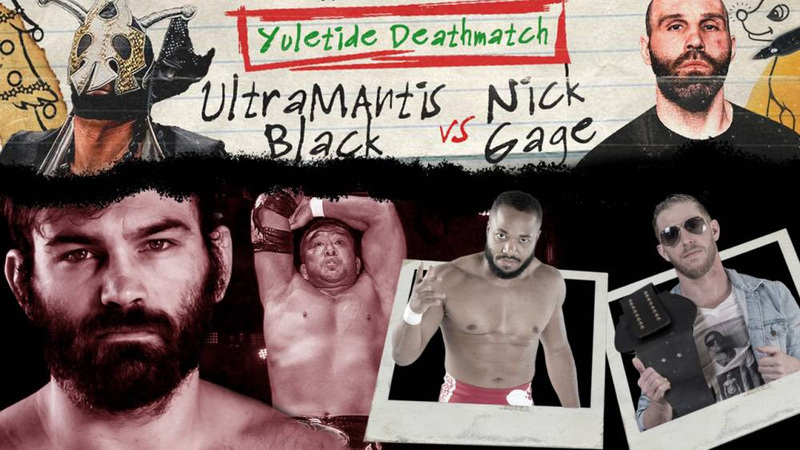 Advanced tickets can be purchased at dynamoprowrestling.bigcartel.com. In the main event, the Dynamo Pro Wrestling heavyweight championship will be on the line as Dynamo Pro Wrestling heavyweight champion “The Wind of Destruction” Makaze will defend against former champion “Lights Out” Adrian Surge. For close to two years, these men have been intertwined in one of the fiercest rivalries in Dynamo Pro Wrestling history. On September 21st, 2018, Adrian Surge defeated Makaze to win the Dynamo Pro Wrestling heavyweight championship. After a vicious attack, organized by Makaze, Adrian Surge had to relinquish the championship and spent nearly five months on the sidelines with a shoulder injury. Through manipulation and intimidation, on November 24th, 2018, Makaze regained the Dynamo Pro Wrestling heavyweight championship. Since regaining the Dynamo Pro Wrestling heavyweight championship, “The Wind of Destruction” Makaze has created a path of misery and destruction throughout Dynamo Pro Wrestling. At our last event at the Concordia Turners Gymnasium on March 30th, “Lights Out” Adrian Surge returned to Dynamo Pro Wrestling and demanded an opportunity to fight Makaze for the championship. Makaze agreed…but some severe provisions. This match with be contested with no disqualification and the loser of the match must retire from professional wrestling. Come out and experience the final chapter of this storied feud on Saturday, April 20th at the Concordia Turners Gymnasium. Since 2007, Dynamo Pro Wrestling has strived to bring professional wrestling fans of all ages with hard hitting, fast paced, edge of your seat professional wrestling action. For additional information on Dynamo Pro Wrestling, you can check out our website at www.dynamoprowrestling.com, follow us on Facebook at www.facebook.com/dynamopro, and on Twitter at www.twitter.com/DynamoPro. For Concordia Turners Gymnasium venue information, you can check out their website at www.concordiaturners.org or follow them on Facebook at www.facebook.com/concordiaturners. Dynamo Pro Wrestling, in association with Gateway Harley-Davidson, are pleased to announce a series of professional wrestling events. 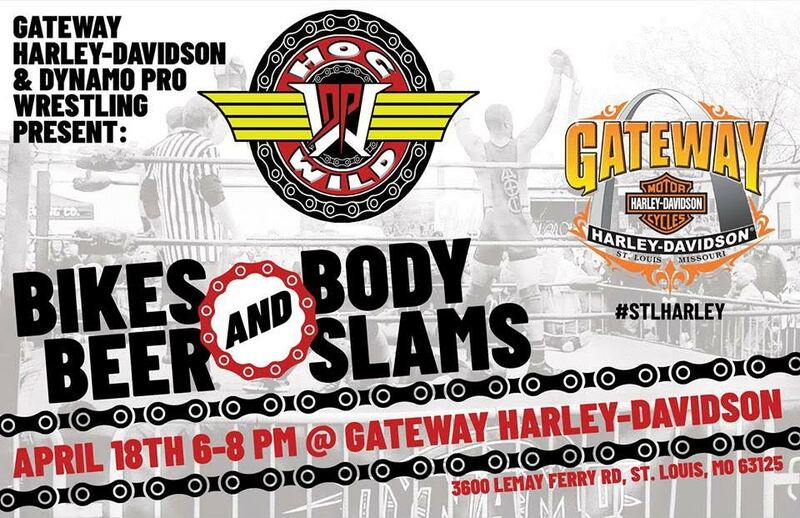 For years, professional wrestling and Harley-Davidson have been highly recognized in the St. Louis area. Dynamo Pro Wrestling and Gateway Harley-Davidson have chosen to come together and present great evenings of professional wrestling. The first event of this series will take place as a part of Gateway Harley-Davidson’s “Bike Night” events on Thursday, April 18th, 2019 from 6:00 P.M. to 8:00 P.M. This event will be held at Gateway Harley-Davidson, located at 3600 Lemay Ferry Road in St. Louis, Missouri. You will see such Dynamo Pro Wrestling favorites as Dynamo Pro Wrestling heavyweight champion “The Wind of Destruction” Makaze, Dynamo Pro Wrestling D-1 champion Mike Outlaw, Dynamo Pro Wrestling tag team champions “The Arch City Mercenaries” Jimmi LaFleur and Tony Asteem, C.J. Shine, “The Valedictorian” Keon Option, Viktor von Stein, Xavier Shadowz, OuTtKaSt, Jackal, “Mr. Moustache” Ricky Rodriguez, “Mr. Excitement” Christopher Adams, and many more. Since 2007, Dynamo Pro Wrestling has strived to bring professional wrestling fans of all ages with hard hitting, fast paced, edge of your seat professional wrestling action. For additional information on Dynamo Pro Wrestling, you can check out our website at www.dynamoprowrestling.com, follow us on Facebook at www.facebook.com/dynamopro, and on Twitter at www.twitter.com/DynamoPro. Since April 2002, Gateway Harley-Davidson has taken great pride in being part of the St. Louis, Missouri area and we believe in giving back to those in the community. We strive to excel when it comes to providing the greatest customer experience possible for every single customer that walks through our doors. For additional information on Gateway Harley-Davidson, you can check out their website at https://www.gatewayharleydavidson.com. You can also follow them on Facebook at https://www.facebook.com/GatewayHarley and on Twitter at https://www.twitter.com/GatewayHarley.